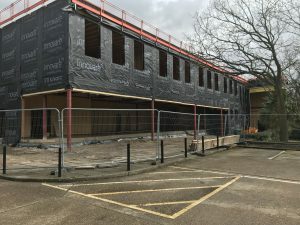 Work is progressing well at Rickmansworth School on their new teaching block where we are currently in week 19 of 41 on site. The building is constructed using a timber frame which is fabricated off site then craned into place. This speeds up the construction process resulting in a water tight building much sooner than if using traditional construction.